Words are not able to describe the happiness and joy I feel from reading an update from Michael Kokoska, now Venerable Michael Thanavirro. When he first join the meditaiton group in 2015 he exhibited wisdom beyond his years, he had a deep interest in meditaiton, and always had insightful questions and later on answers that came from within, albeit through his own practice. A year later in 2016 after joining the meditation group Michael expressed an interest to ordain temporarily as a monk, it took until April of 2017 for him to have the experience of ordination. 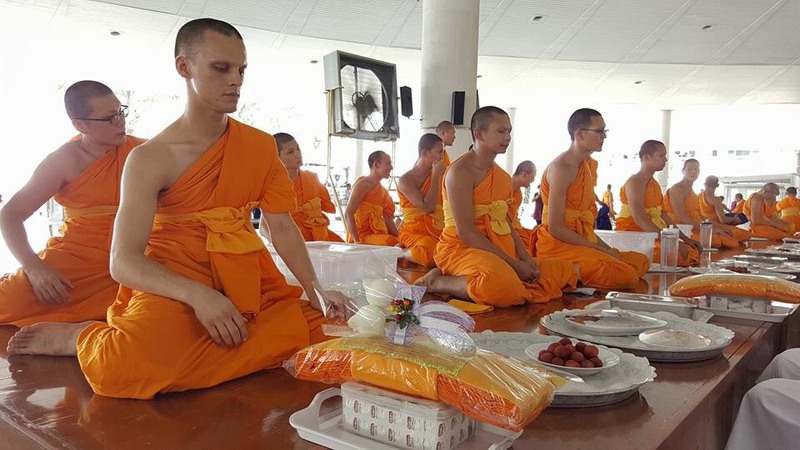 He is the third member from the Georgia Meditation Center's Wednesday meditation group to ordain in Thailand, and our most successful with regards to commitment in Buddhism. He has been the only one who plans to stay in robes for as long as he can, his transformation and story is uplifting particularly as a convert, Michael was never one who claimed to be anything but spiritual, so for him to make such a commitment in Buddhism and his experience with regards to what he is learning is an interesting story in and of itself, much less to be sharing his journey as a Buddhist monk. The happiness I get knowing that I assisted in some way on his journey is priceless. His story is worthy of sharing, giving insight into the life of a monk and the universal teaching that he is learning and passing on....the true purpose in life, which is finding true permanent happiness from within. I am so proud of him and thankful to have had the opportunity to volunteer my time to something bigger than myself. Thanks for the information but I am planning to stay in robes for a while now. Ordination with LP MaPong in PaPae was the perfect way to ease into monkhood as it was a pretty relaxed schedule that allowed me to be independent and focus on meditation in a very serene setting. I stayed in PaPae from April 14th to the first Sunday of May at which point I took a bus to the main temple. I stayed with the IDOP monks at the main temple for 6 days and then I went on two 10 day meditation retreats and then flew back to Chiang Mai with LP MaPong on the 5th of June. I plan to stay here in PaPae until the first Sunday of July and then head back to the main temple, disrobe, and then join IDOP 15 and reordain at the main temple on the 20th of July. I am doing this mainly so that I can get a monk ID through Dhammakaya and be in the system so that they can be fully responsible for me and so I can stay as long as I want without worrying about visa issues. It will also be nice to experience the ordination ceremony at the main temple. After IDOP is over I will enter rains retreat from August to November so that I can learn Thai and study Dhamma at the international Buddhist training center's (IBTC) library. After rains retreat I will stay in robes day by day. As long as I wake up happy, content and motivated to learn and deepen my meditation I will continue my monastic journey. My meditation has progressed tremendously these past month and a half to two months, but I know I am only scratching the surface of what's possible. I have some distant aspiration of joining khong roi (probably spelled that wrong) which is the part of the temple that focuses solely on meditation (often sitting for 4 hour sessions) and therefore the teaching monks only know how to speak and teach in Thai, which is an extra motivation to learn the language. But I am not planning too much into the future so as not to get ahead of myself. I am just living in the moment and practicing diligently aiming to meditate for 40hrs/week or roughly 6hrs a day like it's a full time job. So far so good. Also I just want to thank you for being such an integral part of my journey. Without your efforts at the GMC I certainly would not be having this amazing transformative experience so I just want to let you know how grateful I am for you being a catalyst to my spiritual journey. I was overjoyed with happiness when I received his first update as I wasn't expecting that he had an interest to stay in robes and that he was interested in learning how to read/write Thai and get a monk visa! I was so proud. He is the first person from our Wednesday meditation group to have want to take his practice to the level of ordaining for as long as he is content, most do it temporarily. What makes me so excited for him is knowing that he will have the tools and access to elevate his mind, this type of happiness that you feel being a part of someone's journey is priceless and words can't express the joy, it's almost like winning the lottery if I had to guess, only even more powerful than that because it comes from a higher place. Michael sent another update on 7/6/17. I think this will be it for awhile now, this update was for family and friends and it was even more insightful. As I read his update I got goose bumps and found myself yet again elated with so much joy, he is learning so much and I can tell from his writing he is a great teacher in the making! Venerable Michael will be the light that shines so brightly that others can see through the dark! 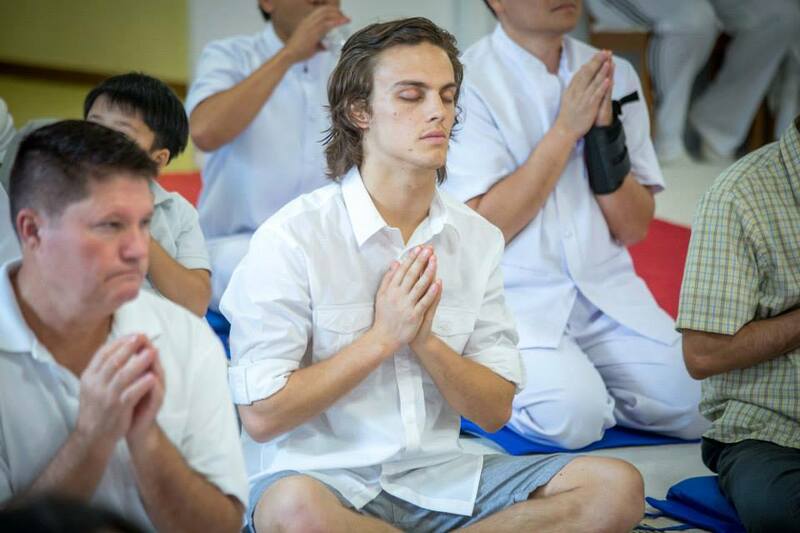 No matter what happens down the road to know that what he is learning right now is valuable and will help him throughout his life makes my work of supporting the Georgia Meditation Center the best thing I could have ever done. Update from Venerable Michael below, it is long, but worth the read for anyone who has an interest in Buddhism or the Life of a Monk this is a must read! I have his permission to share it. Fair warning: this is going to be an EXTREMELY long e-mail, so sorry if it is longwinded. That’s just how I am with these things. I feel the need to be thorough so as to accurately represent a lifestyle that is completely foreign to most of you. I also want to be thorough, because I don’t plan on doing this again for a long time. It has been very time-consuming and a distraction for my presence of mind. But its ok! I do it for my people! Anyway, feel free to forward this to anyone who you think might enjoy reading it. I couldn't figure out how to create hyperlinks on my tablet so you will have to copy and paste in your browser to see the pictures. As I’m sure most of you know, I flew to Thailand back in April and ordained as a Buddhist monk. So much has happened in the past couple of months or so that I surely won’t be able to cover everything, but I would like to share some of my experiences, discoveries and plans for the future with you. Sitting here on my 1 inch thick bedding with my back propped up against the wall of my 11 square foot kuti (hut or abode for monks) clad in my vibrant orange robes, I’m wondering where to start and what to share…I guess it makes the most sense to start at the beginning, but I won’t always be telling my story chronologically and will often go off on tangents; hopefully it will still be easy to follow. Without further ado, welcome to my memoirs from monkhood. So my flight from Atlanta left the morning of April 12th and after a missed flight from Seoul, Korea to Bangkok and about 22 hours of time in the air, I eventually made it to my final destination, Chiang Mai, on the evening of the 14th. I was greeted at the airport by the ubasok (title for male lay devotee to monks) Phi Prajak who lives in the surrounding village at the Pa Pae meditation retreat center. He drove me an hour from Chiang Mai International through windy mountain roads to the center. We arrived pretty late around 10pm, so he showed me to my kuti to settle me in for some much needed rest. He opened the door and flicked on the lights…nice! electricity! He also showed me to the restrooms about 50 yards away…nice! toilets! And shower heads! I was afraid I was going to be living by candle light, going to the bathroom in a hole and bathing in a river, so I was relieved to see these modern accommodations. My thin bedding wasn’t very comfortable at first, but I soon learned the reason behind this; as Luang Phi (informal title for monk [phi-pronounced like pee]) MaPong explains, the not so comfortable bedding makes it so that we don’t fight with gravity too much in the morning and overindulge in sleeping. I actually have grown to prefer this sleeping arrangement for that very reason. So I woke up the following morning, dressed myself in the all white uniform that they give to all guests at the retreat center (to signify purity and also to encourage mindfulness because white gets dirty easily), and walked down towards the community house for breakfast. The morning sun bathed the retreat grounds in a soft, warm light and illuminated the beautiful natural surroundings that were cloaked in darkness the night before. As I breathed in the cool mountain air, the sound of birds singing, crickets rhythmically chirping, frogs intermittently croaking, roosters and dogs exercising their vocal chords, and the distant hum of the bustling village going about its morning activities below created a beautiful symphony that I have grown to know and love. I made it down to the community house, Merit House, where I met the upasika (female devotee for monks) Phi Mali and the guy from Japan who was going to ordain with me, Michiharru, or Michi for short. I was further relieved at my first breakfast when I discovered that Thai food, even in a rural village, is very delicious. After breakfast, we met our Phra Ajahn (respectful title for teaching monk) LP MaPong. I can’t say enough positive things about this man. During my stay here in Pa Pae, I have learned much from his Dhamma (universal truths discovered and taught by the Buddha, Dharma in Sanskrit) talks given to the numerous audiences who have come for the 3 day retreats as well as while working and living alongside him. The conversations over breakfast are the times where we have discussed the deeper and more interesting topics and where I have gotten to know him more intimately. He is an immensely intelligent, empathetic, supportive, creative, industrious, kind-hearted man with a great sense of humor and a quick wit, so we get along well. He is also extremely well educated as a non-practicing medical doctor (the Ma in MaPong stands for doctor) and also possesses a solid understanding of the Western mind. These attributes allow him to incorporate science and cultural references into his Dhamma talks to engage and connect with all the farang(non-insulting name for Westerner that I hear all the time) that frequent the retreat center. He also has a knack for design and is the creative mind behind all of the meditation halls and other attractions of the retreat center such as the artificial waterfall, the bamboo meditation platforms hanging from a large tree, and the newly installed swing set with seats big enough for meditation. It’s like a big spiritual playground in the middle of nature that the retreat participants really enjoy exploring. With a focus on comfort and aesthetics, this retreat center contrasts greatly from the strict and often bland nature of other Vipassana retreats that require 7 to 10 days of silence in a white-washed, enclosed building. Although this can still bring about positive changes for a new meditator, it leaves them with the erroneous impression that meditation has to be difficult and very painful. Meditation at the Pa Pae center is staggered with Dhamma talks, free time and gardening/cleaning of the grounds which creates a more relaxed and comfortable schedule for the 3 day retreat, although participants can stay as long as they want. There are also plans to plant rice and various other crops to provide another activity for participants to do to connect with nature and have a break from meditation. Well that’s enough promotion for the retreat center. Lets get back to my experiences as a monk. So about 4 days after I arrived at the center, we had the hair shaving ceremony, which was a very memorable experience. Michi and I were made to meditate upstairs in Merit House while villagers and retreat participants gathered around outside for the ceremony. After a bit of waiting, this pleasantly corny song “The Life of a Monk” started to play which was our queue to pick up our lotus blossoms and walk downstairs to the area where everyone was seated outside. We sat down front and center on our chairs and the villagers came one by one with scissors and started lopping off chunks of our hair and placing them in a pile on a lotus leaf next to us. The group present for the 3 day retreat then followed suit. Participating in the hair clipping ceremony, like every ceremony in Thai Buddhism, is considered to create merit (positive karmic/mental/spiritual energy gained from wholesome deeds) for the participants. After everyone took a snip, LP Mapong lathered us up and shaved off our remaining hair and eyebrows. I knew this moment was coming for a long time, but as I felt the blade scrape across my scalp and brow and looked down at the growing pile of shaving cream coated hair in the bowl in my hands, I experienced a few moments of “haha wow, what am I doing?” However, these moments of doubt were short-lived and quickly replaced by a sense of calm, equanimity and conviction in the spiritual journey which was finally underway after two years of preparation and anticipation. The real moment of truth came when it was time to look in the mirror…gasp! My bald, eyebrowless head actually looks pretty good! I couldn’t help but think that I looked link Ang from Avatar the last airbender, which I could definitely live with. Although the lack of eyebrows took some getting used to, I have grown to really enjoy the low maintenance hair do. You can’t have a bad hair day without hair! So a few days after the hair clipping ceremony on April 20th, it was time to be ordained as a Buddhist monk. Luckily for me, the preceptor (high status monk who ordains all monks within a district) was a really chill guy who allowed us to read off of sheets for our ceremony. At the main temple, the whole process has to be memorized perfectly, but for us, only the alms blessing had to be from memory. There were 7 monks present for the ceremony who acted as witnesses and participated in some chanting and also helped us change into our robes. The retreat participants also played a role and held umbrellas over us as we walked around the chapel 3 times (circumambulation). The whole ceremony lasted about one hour and besides some discomfort from kneeling and hot pavement on my feet, it was pretty painless. I was now officially Phra Michael Thanavirro (Pali name meaning rich in status). I was hoping for a name that had something to do with wisdom, but whatever, its just a name. Plus, I’ll be getting a new one soon when I reordain at the main temple…but more on that later! As a brand new monk, it is almost like becoming as ignorant as a child again. You don’t know how to dress, how to eat, how to conduct yourself in public, and many other things that came as second nature to you as a lay person. At this stage, a healthy dose of humility and patience is necessary in order to accept and be grateful for every instance that the teaching monk tells you not to do something and shows you the correct way. It took me about a month and a half to even be able to properly dress myself in the 3 different styles appropriate for various occasions. Here are a few other things that I had to get used to: no singing or whistling (anyone who knows me well knows my affinity for whistling), no biting into food (i.e. you have to eat a banana or a chicken wing with a fork lol), you have to sit when you pee (so as not to make a mess or excessive noise…women probably wish all men followed this one), no dancing, no music, no running, no solid food after midday, oh and one that everyone struggles with—no killing mosquitoes. These are only a few of the 227 precepts or rules of conduct to abide by in Theravada Buddhism. Why so many? Well, in the Buddha’s time over 2500 years ago, there were many instances where a monk would get into some troublesome situation or behave in a way unbefitting for a monk and then the Buddha would make a rule to prevent this situation in the future. For this reason, some of the rules may seem archaic or irrelevant, but Theravada Buddhism preserves the rules in their original format regardless of the times. If you modify or get rid of rules to adjust to modern times, then this could lead to the dilution of the teachings and the eventual loss of the essence of what the Buddha taught. However, instead of stressing over the minutia of the Vinaya (monastic moral code) it is more useful to understand the overarching principles. These are as follows: non-harm, contentment, integrity, restraint, honesty, a devotion to sobriety, and the constant clarification and sharpening of knowing. When cultivated, a strong Vinaya practice leads to harmlessness to others and harmlessness to oneself which is crucial to living a wholesome, happy life, monastic or otherwise. This strict morality also avoids the shame and remorse associated with unwholesome actions thus making the mind clearer, more still and primed for ever deepening states of meditation. With so many rules, it may seem like this lifestyle is repressive, excessively strict, and lacking of any flavor or enjoyment. On the contrary, I have found great contentment in the richness of a simple life based in restraint and mindfulness. This is a night and day switch from the American mentality which places high value on the pursuit of happiness through freedom of choice. We constantly pursue happiness by gratifying our senses and bolstering our egos by: going out to nice dinners, expanding our overstocked wardrobes, pursuing that fancy promotion with a fat paycheck, intoxicating ourselves with our friends and family, endlessly browsing and posting on social media, maintaining toxic relationships to avoid loneliness, vacationing at the beach, lining up to buy the iphone 13 the day it comes out, binge watching netflix with a carton of ice cream, going to music festivals, and a slew of other fun and exciting experiences. We have the freedom to pursue happiness in any way that we choose. But it seems like there is no lasting happiness to speak of. Just an everlasting pursuit. Always becoming, but never actually BEING happy. Satisfaction from this sense gratification fades so quickly that we are soon off to find our next fix. Perpetual distraction. Mindless consumption. Is this really freedom? Being a slave to fleeting desires that we barely understand and can never sate? The realization of this reality in my own life and its trivial pursuits is what drew me to giving renunciation a try, and I have discovered something interesting: freedom FROM choice. How often do you stress over what to wear, where to go out to eat, what to make for dinner, what to do on your day off of work, what class to take, who to hang out with, what show to watch, what concert to go to, and in general how to spend your time and resources? So many choices! What a burden! As a monk, I have two sets of robes that I always wear, can only eat what is offered to me, meditate for about a third of my waking hours, and spend the rest of my time chanting, doing chores, and reading books. Every activity is already planned by someone else, so I just go with the flow. The cliché “less is more” has truly taken on a deeper meaning for me. I am living the ultimate minimalist’s dream. I’m a gainfully unemployed, single, college dropout with very little material possessions. By American standards, I’m a failure. But, luckily, I no longer measure myself by American standards. Sure, I’ve given up the freedom to do and have a lot of fun things, but I’ve also entirely given up stress and worry and gained an ever-deepening peace of mind and understanding of myself. A trade I am happy to make. When I told people about what I was doing, a number of them were like, “wow that’s gonna be so fun…well not really fun, but life changing!” This made me realize that we often confuse fun and pleasurable experiences with happiness. No, I wouldn’t describe renunciation and strict morality as fun, but it has allowed me to undo my cultural programming which overemphasizes endless distraction and consumption to indulge our desires as quickly and frequently as humanly possible. Aristotle said, “real show of power is in restraint”. Well, if Aristotle said it, then its gotta be true, right? What I really want you to understand from this little rant is that I did not adopt a lifestyle of suffering in the name of personal development. Yes, like all human beings, I still suffer, but less frequently and in different ways than I did as a lay person. I also don’t want you to misunderstand these sentiments as coming from a place of self-righteousness or a sense of superiority to people who constantly seek satisfaction in the American fashion. This would be awfully hypocritical of me. These sentiments are rather coming from a place of empathy, because I have experienced deeply the pain and dissatisfaction that are inextricably attached to excessive sense gratification and ego inflation. And you don’t have to do something drastic and crazy like quitting your job and becoming a monk to enjoy the benefits of self restraint and morality in your daily life. The positive transformation of the quality and ease of my life at home before leaving for Thailand is a testament to this fact. But ultimately you will have to discover these truths for yourself. Even if what I am saying makes sense to you, when this lifestyle is all you have ever known, its almost impossible just to will yourself into making and maintaining such a lasting change. This is where meditation and mindfulness are most important. You can understand cognitively that you would like to incorporate more restraint and morality in your life, but if you don’t internalize this need through meditation and constantly guard your mind with mindfulness, then you will surely succumb to the sirens of sense gratification and the mind will resort back to its own deeply-entrenched, self-destructive habits…but more on meditation and mindfulness later. Let’s pick back up where we left off with my experiences as a newly ordained monk. So for the first four days after my ordination, LP MaPong, Michi and I did an alms round throughout every section of the surrounding 200 house village, Pang Mukluay. Many people misunderstand alms round as comparable to a homeless person begging for food, so let me explain the reality of the situation. In order to maximize time for meditation and investigation of Dhamma, Buddhist monks rely on lay people to prepare and offer food to them. If nobody offers food, you cannot eat. Luckily, there is plenty of support for the monastic community in Thailand, so you are pretty much guaranteed 2 meals a day. Lay people offer this food trusting that you are conducting yourself in accordance with the path that the Buddha taught to the best of your abilities. As a monk you can meditate longer, study more Dhamma and hold yourself to a higher moral standard than would be possible as a lay person. Supporting a Buddhist monk in the cultivation of his mind by offering any of the four requisites (food, medicine, robes, and shelter) is considered to accrue much merit for the donor. In addition, the monks can teach Dhamma to the lay people to help them understand and lessen the suffering in their own lives. This is a very symbiotic relationship trading material substance for spiritual substance and therefore differs greatly from the act of begging for food out of desperation. Each one of my alms round experiences have been deeply moving and very memorable. So we start by taking off our shoes (mimicking the monks of the Buddha’s time) and walking barefoot through the village in a single file line with our bowl strap strung over our right shoulder. Typically, we also have some lay people following in a car that we can empty our bowls into as they fill up. The night before an alms round will take place, the village administrator makes an announcement over the loud speaker so that people can be prepared to offer food to the monks. Villagers intending to offer food will put a chair with a basket on top of it out in front of their driveway to signal their intention. After we gather in front of the donor’s house, they will come to the street, take off their shoes and start placing food into our bowls. After all the food is dispensed, they will then kneel down on their shoes and wait for us to chant our blessing. Many times the villagers will pour water onto the ground from some receptacle as we chant. This action is symbolic of sharing merit with deceased relatives who are said to lack the ability to gain merit since they are lacking human form. At the end of our chanting, you usually hear a resounding “Satthuuuuu” which is probably the most used word in Thailand that basically means thank youuuu, but can mean various other things as well. Even though I’m supposed to keep my eyes downcast, I usually can’t help but steal a glance at them. When I do I’m often met with stained, gap-filled yet deeply genuine smiles that make you marvel at their generosity and kindness. Although some of them may be lacking in material wealth, you can observe a wealth of happiness within the softness of their eyes and warmth of their smiles. There was one specific instance that I will never forget. We were doing an alms round at a neighboring village and had just received more food than could fit in our bowls by a group of about 10 villagers. There were men, women and children lined up receiving our blessing. Right as the blessing ended, this chubby baby in the arms of its mother let out the most satisfying, Notorious B.I.G.-esque belly grunt you’ve ever heard “aaaAAHHHhh”. Everyone present burst out in hearty laughter at the timing and spontaneity of this moment. It was a moment that transcended the cultural, societal, and language barrier separating foreign monk from rural villager facilitating a connection that accentuated an already beautiful experience. After the first four days of being a monk, I have only participated in two other alms rounds, so these are special occasions. Typically our food is offered by a few villagers and the lay devotees of the retreat center. Since I have been in Thailand, I have divided my time as a monk between the retreat center and the main temple in Bangkok. 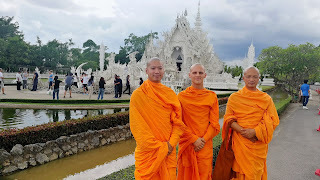 I spent the last half of April and the month of June at the retreat center in Chiang Mai and spent the month of May with the international monks from the main temple in Bangkok. The daily schedule and atmosphere of each location differ in many ways, so I will start off by describing monk life at the retreat center first. For the first few weeks, I attended each of the sessions that LP MaPong led for the retreat participants. The day would start off at 6 AM with morning chanting at Bamboo Hall. The activity of chanting originated around 2500 years ago and served as a way for the monks to preserve and pass down the Buddha’s teachings. All the monks would commit these chants to memory and chant them in unison so that any gaps in memory from a single monk could be filled in by his peers. Chanting in Theravada Buddhism is performed in Pali, the language of rural ancient India, and has a threefold purpose: to create a sense of solidarity amongst the monastic and/or lay community as they chant together, to accompany certain ceremonies, to pay homage to the Triple Gem (The Buddha, the Dhamma, & the Sangha[monastic and lay Buddhist community]), and as a breathing and vibrational preparation for meditation. If you have the chants memorized, then the act of chanting becomes much less cognitive and much more meditative. Understanding the translations of what you are chanting also serves to make the experience more powerful. So after morning chanting which would last about 20-30 minutes, we would sit for about 40 minutes of meditation. After this, the monks and retreat participants would go our separate ways to eat breakfast. For the month of June, once the local school was back in session, we would be greeted every morning by the young students running around in their uniforms screeching “Phra Ajahn Phra Ajahn! !” Some were pretty helpful and set up the table with the dishes from the drying rack, wiping away any excess water with a tissue. Others just ran around screaming. The first week or so they were afraid of me and would scream and shy away when I tried to hand them a carton of lactosoy (sweet soy milk that seems to be a staple in Thailand). But they quickly warmed up to me especially when we had caramels to give them. The tall white guy isn’t so scary when he has candy, I guess. After they got their little treats, they would pay respect to us by bowing three times. Then maybe we would be lucky to get them to say, or more accurately yell, their ABC’s or count to 10 in English before they scrambled out the door and stampeded up to school before it started. This not-so-peaceful part of my morning routine was actually kind of nice as it let me observe the joyful innocence of children as well as reminisce on my own unruly, hyperactive childhood. So breakfast would be followed by a meditation session and Dhamma talk at 9:30 which would lead up to lunch at 11:30. The next session would be from 2:30 to about 4 followed by cleaning/gardening from 4:30-6:30 or 7. The monks would then have some Panna (afternoon/evening snack consisting of non-solid things: yogurt, coffee, soy milk, etc). Why no dinner? Fasting after midday has a number of benefits. Firstly, eating dinner would cut into meditation time as well as making meditation less productive due to digestion. Also, going to bed on an empty stomach is good for your health. This practice allows you to have a restful sleep devoid of nightmares caused by nocturnal digestion, and it also allows you to wake up and have a good, hearty breakfast in the morning. I’m sure you’ve heard that breakfast is the most important meal of the day, but in most countries, especially America, it is neglected. That’s because our stomachs are still full from the night before, so half a bagel and a cup of coffee it is! It took a little bit of getting used to, but now I really enjoy the benefits of fasting after midday and breaking the fast with a big ole Thai breakfast. So after Panna, we would have the evening session around 7:30 with meditation and a Dhamma talk that would end around 9:30. I would then prepare for bed and usually fall asleep around 10:30. This was my schedule for April, but for the month of June it was much freer. LP MaPong allowed me to meditate on my own instead of joining the sessions, so the only schedule I had was breakfast, lunch, gardening, and sharing my story with the participants once per retreat. This freedom was great for me, because I could meditate for longer hours and then fill in the remaining time with reading Dhamma. In addition to my desire to deepen my practice and knowledge, I feel like I have an obligation to the lay supporters to practice myself as diligently as possible. In my eyes, being a lazy monk is the ultimate disrespect to the lay supporters who make this lifestyle possible. So for the month of June my schedule was usually to wake up at 4:30, do some stretching and then meditate in my kuti by candlelight for an hour and a half or two. I would then go to breakfast at 7:30 and try to meditate another hour before lunch. After lunch, I would read a bit while my food digested and then meditate for a bit. Once my body ached too much, I would get up and do about an hour of yoga. My Yoga practice compliments my meditation practice by limbering the body so it is not a distraction as well as calming down the mind. After a nice Yoga session, I will sit down again for about an hour of meditation until gardening time. Gardening usually consists of deweeding with spades/hoes and planting grass. This is actually pretty labor intensive, but it is another good way for me to stay in shape as well as to give back to this center that has given me so much without charging a dime. This time also provides me with an opportunity to talk to the Westerners visiting the center. In addition to fulfilling my social needs, this interaction gives me an opportunity to share what I have learned with like-minded people at different stages in their spiritual journey. I can answer questions they have about the monastic life or offer them guidance rooted in direct experience or Dhamma that I have studied. It is very satisfying to be able to connect so deeply with strangers from all over the world without having to actually travel anywhere. I try to be as open and transparent as possible with these people to show them that even though I have no hair or eyebrows and am dressed in orange robes, I am not so different from them; I too want fulfillment and happiness out of life and have experienced many of the same suffering they do. We are just on different paths. So after gardening, I would shower, get some Panna, chant the Dhammacakka Sutta (the first teaching the Buddha gave after enlightenment), and then meditate a bit more before going to bed around 10:30. That pretty generally sums up what my life was like at the retreat center. I spent the month of May and will be spending the following months at the main temple which is more near Bangkok. I am planning to disrobe on July 7 and join IDOP on July 8 which is a training program at the main temple for new international monks. I will be joined by 30 other English speaking men and about 50 Chinese speaking men of widely ranging ages from around the world. We will ordain on July 22nd at the main temple. I am doing this for a couple of reasons. One is so that I can be trained more thoroughly in discipline and experience the special ordination ceremony offered at the main temple. The main reason, however, is so that I can get a monk ID which will act as my visa and allow me to stay in Thailand as a monk for as long as I want. The IDOP program lasts 45 days, and when it ends in August I will join the rains retreat. In the Buddha’s time, monks used to travel during the rainy season, and they would incidentally ruin some of the farmers’ crops when treading through rain-soaked fields. To avoid creating such problems, the Buddha mandated that the monks stay in one place for the 3 month rainy season and focus on meditation and study of Dhamma. This tradition is still observed to this day, so I will be joining the rest of the monks at the temple’s library to learn Thai and study Buddhist scriptures from August to November. After rains retreat, I will continue to be a monk day by day. Every day that I wake up content with this simple life and excited to deepen my meditation and understanding of myself, I will stay in robes. Upon leaving the states, I had so many plans of travelling, getting my yoga teacher certification, working abroad and much more, but I have started to let go of these things. As my uncle so wisely told me before I left, “A bird in the hand is worth two in the bush.” I think he was just being his typical goofy self, but this has been such a relevant piece of advice for me. There’s no need for me to pursue some other shiny, romantic goal when I am so deeply content and happy with the opportunity at hand. I may pursue these things later on down the road but for now, I am living completely in the moment and doing my best to let go of any expectations for the future. So now I need to address something that I don’t like having to talk about and was thinking about avoiding altogether. Maybe I will regret bringing it up at all, but I dislike secrecy and feel that it is necessary for you to understand my situation and the temple that I am a part of. If I just let you read the propagandized articles on the internet then you would certainly get a very negatively skewed picture of the temple. So the name of the temple that I am a part of is called Wat Phra Dhammakaya. In addition to some dazzling pictures of their pagoda of 1 million golden Buddhas, a quick google search will bring up numerous articles about recent allegations against the temple’s abbot for money laundering. These allegations were levied by the current military-run government that overthrew the democratic government in a military cout a number of years ago. It is also of importance to understand that Thailand’s economy is not experiencing any economic growth at the moment. Now this government may or may not be corrupt; they may or may not be intimidated by the influence of Wat Phra Dhammakaya as the largest Buddhist temple in Thailand; they may or may not be fabricating stories to defame and lessen the influence of the temple and take the focus off of poor economic conditions, and finally there may or may not be free speech in Thailand. Just kidding on that last one. There definitely is no free speech or public criticism of the government in Thailand, hence all the “may or may nots”. I have not definitively said anything! These allegations claim that the temple accepted money that the donator had acquired through embezzlement. Somehow the temple was supposed to know where the funds were coming from, which is pretty ridiculous. The only way I see this as being possible is if the temple asked each donor, “excuse me, was this donation obtained legally?” which is obviously not appropriate. Unfortunately, the media is completely against the temple and their reputation has been tainted because of this. This issue was the reason I postponed my ordination from 2016 to this year. However, the situation has settled down quite a bit, and daily activities resume as normal. Am I trying to imply that the temple is completely innocent of any blame? No, because I couldn’t possibly know that answer. I can certainly see why these stories would be believable due to the temple’s massive structures and huge fund-raising ceremonies. These ceremonies on the first Sunday of each month and on Buddhist holidays seem very impersonal to me and lack a genuine connection between teaching monks and the rest of the congregation. Everything is on a mass scale and follows the industrial model that bigger is better. On these occasions, the grand airplane hangar-esque meditation hall is packed with over a thousand monks, and many more thousands of lay people in all white. The Dhamma talks are given over a loud PA system that echoes over the noisy hall, and meditation is done in the same way. It was very intimidating for me walking through the crowd on my first Sunday as the only Western monk present in the entire place. It didn’t have the same intimate atmosphere that I had grown accustomed to at the Pa Pae retreat and the Georgia meditation center. There have been times of doubt when I fantasized about seeking out the more austere and secluded life of the Thai forest monks filled with more quietude and meditation. However, there are a number of aspects of the temple that I have deeply connected with that heavily outweigh the negative aspects. These positive aspects of the temple are often overlooked and poorly understood by critics on the outside looking in, so I will provide you with some insider perspective. The aspect of the temple that inspires the most confidence in me is the meditation technique, because I have directly experienced the transformative power of a still mind resting at the center of the body. Although I’m sure I could experience benefits from practicing other techniques such as observing the breath, I am convinced that observing an unmovable point leads to a deeper transformation of the mind. The center of the body is also a very special place and is said to be the home of intuition. Ever have a strong “gut feeling” that a person or situation just wasn’t right? I’m sure you’ve noticed that these intuitive feelings seem to emanate from the area of your stomach. This is the center of the body at work trying to lead you out of harm’s way. It is not a logical or analytical process. It is a feeling. It is intuition. When you learn to calm the mind and allow it to gravitate and eventually rest at the center, you can hone your intuition. Once you locate the center through a habit of meditation, you can connect with it throughout your day. It then becomes much easier to surrender to the flow of life and not overanalyze things, because you have a clear mind, understand your intentions and therefore trust in the decisions you make. You learn not to regret the mistakes you make but rather to accept and appreciate them as some of the best teachers that life has to offer. This process started for me shortly after I began attending the weekly sessions at the Georgia Meditation Center, and it steadily lifted my life from a dark place of delusion and suffering to a purpose driven life led with clarity and a respect for others and myself. But I have already told most of you that story in the email I sent a year ago, so I won’t elaborate on that anymore. I also won’t elaborate further on the technique and the various other reasons why it is effective and will instead put some links at the bottom for those wanting to dive deeper. The next aspect that endears me to this temple is the deep sense of belonging that I feel due to the way I am treated by my monastic brethren. Respect and consideration of others are the pillars that support our speech and behavior. This eliminates petty talk and gossip which always seemed to be present in my life outside the temple. This is such a refreshing change of pace. I always seem to leave conversations having gained something valuable as opposed to just exchanging noises to fill the silence. Although there are plenty of deep, philosophical conversations, most monks also have a great sense of humor, so there are many light-hearted, laughter-filled moments as well. Every monk is like a friend, mentor, and brother who has your best interests in mind and genuinely wants to see you grow into the happiest version of yourself that you can be. A conversation with the Phra Ajahn for international monks really exemplifies this fact. I expressed my concern about the environment of the temple and whether or not it was suitable for deepening my inner peace and contentment. He responded by telling me that it was my journey, and that if I wanted to study under another temple at some point, then I was more than welcome to if I got permission from that temple’s abbot. He didn’t try to persuade me that this was the best place for me to be a monk. He didn’t try to defend the temple or downplay the obstacles that many westerners face trying to find their place within this organization. He instead made it clear that it was my journey, and ultimately I have to trust in and follow my own intuition and wisdom to the path of most fulfillment. This attitude that emphasizes individual happiness over allegiance to an organization provides me with a sense of ease knowing that I can disrobe or study under another temple at any time and no feelings of ill-will or betrayal will be held against me. The amazing empathy, understanding and support that I feel from my fellow brothers in orange has really made this temple feel like home. Another thing that most people don’t understand about Wat Phra Dhammakaya is their mission to spread meditation around the world. Now this may sound a little evangelistic, but notice how I said meditation and not Buddhism. A large portion of the funds donated to the temple are funneled straight into these initiatives which are rebranded without the Dhammakaya name. Besides being a smart marketing tactic, this shows that the temple does not care about name recognition, pushing their ideology on others or growing their membership. I have found that this is actually more generally a Buddhist mentality than a characteristic that is unique to the temple. Whether you believe in one god, many gods or no god, it doesn’t really matter; meditation and the teachings of the Buddha can still enrich your life and decrease your suffering. In this vein, Dhammakaya has some programs like Peace Revolution that focuses strictly on meditation without incorporating Buddhist teachings to reach people who shy away from religious ideology but yearn for a spiritual practice. With the motto “world peace through inner peace,” the goal is to spread meditation to as many people as possible, which I believe is the only way to redirect humanity towards harmony and away from the path of destruction that we are currently on. It is very clear to meditators that lasting change and peace originate from within the individual. The most effective social activists like Mahatma Ghandi and Martin Luther King Jr. knew this fact very well. Nowadays we are facing so many social, economic, and environmental issues, and yes: they are real; they are scary, and we are also more aware of them due to our instant access to information. The channels through which we receive this information frame the situation in such a way that always identifies some enemy who is the source of the problem. For this reason, we are always looking for someone to blame. We always require some external enemy to fight. If we aren’t overcome by apathy and our own perceived inability to help, we may be inspired to join some relief efforts or go to protest rallies or something of the sort to raise awareness. But these are often only Band-Aids placed over a deep wound. A wise person once said that the same mode of thinking that created the problem cannot fix the problem. What is needed is a global shift in consciousness. If we continue operating from an Us vs. Them mentality, we will just perpetuate the problems that we strive to fix. We need to stop looking for some external enemy to eradicate and have the courage to look within ourselves to see the forces of greed, hatred, anger, fear and ignorance that are present and work to let them go. The only way this inner change is possible is through meditation. Meditation steps out of the confused cognitive mind and allows us to see ourselves and the world around us more clearly. The mind is the lens through which we view the world. When the lens is distorted by greed or blurred by anger or hatred, we observe a misrepresentation of reality. When ignorance is present in large amounts, it is like looking through the lens into darkness with no source of light to illuminate the way things really are. In this way, we stumble through life always running into sources of suffering for ourselves and others without ever understanding why. Meditation allows us to systematically become aware of these impurities of mind, accept them, understand them, and then slowly let them go. It also cultivates empathy, compassion, understanding and a realization that we are all human beings experiencing suffering and just trying to be happy. We are all indelibly interconnected and only through caring for each other and the world around us will we ever live in peace and harmony. But it starts with us. It starts with you. People often believe that you have to do some grand thing or be someone exceptional to change the world. But the reality is, we change the world every day just by existing in it. The way you treat every person you come into contact: your family, friends, significant others, coworkers, strangers in traffic, and even the people you dislike, has ripple effects that you will never grasp. Its up to you whether those are positive or negative ripples. Don’t underestimate your power to shape the world at large by shaping the world around you. Through the power of meditation and mindfulness we can exercise patience and understanding in the face of all the difficulties that we experience in our daily lives. As MLK once said, “Darkness cannot drive out darkness, only light can do that. Hate cannot drive out hate, only love can do that.” We have to stop focusing on the impossible task of trying to change others, and face the forces of darkness within us. Only then can we work to overcome them and discover the light within each of us and let our best selves shine through. This is the most effective way to “be the change you wish to see in the world”. Soooo…those are some of my thoughts about the temple and meditation and why I think both of them are pretty great. The temple is not perfect, but I also don’t believe that a perfect place exists. Running around seeking out the perfect set of circumstances is a fool’s errand and wouldn’t lead me to any deepening peace. I connect with the people and the mission of this temple and my meditation hasn’t been near as good at any other place, so that is good enough for me. Hopefully, my little ramblings didn’t come off as too preachy, but I’m sure it might have to some of you. Ultimately, if even one of you is inspired to meditate or if this plants the seed for you to look into it later down the road, any amount of misunderstanding is worth it. Also if you need more scientific proof that meditation benefits the body and strengthens the brain, just google the scientific/health benefits of meditation. Well, I think I better wrap it up here with some resources for your further exploration. At the very least, I hope you enjoyed reading and learned a few things about the life of a monk, Buddhism and meditation. And as a gift for those of you who have read this far, here are some pictures! 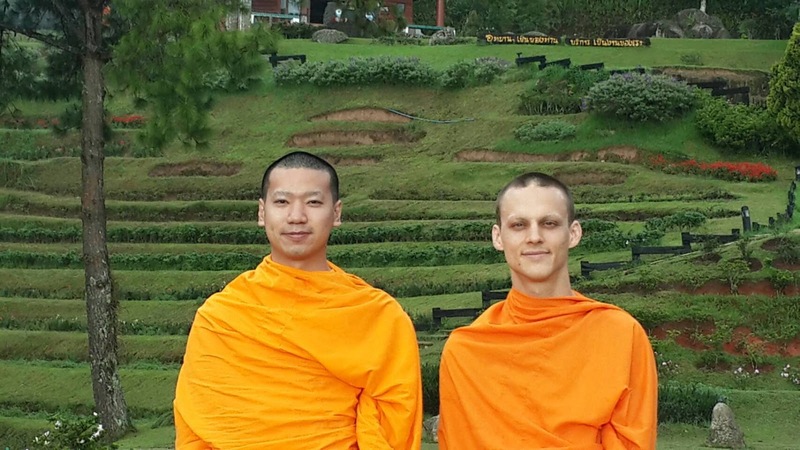 Just so you are aware, monks aren’t supposed to smile in pictures, so that’s why we look so serious :)I will not have internet for the next month and a half but feel free to reply to this email and I will try to get back to you as soon as possible. This organization provides you with a 42 day program to learn meditation at your convenience. If you complete this fellowship program, set up 2 group meditations, and complete an interview you are elligible to come to Thailand for a 2 week retreat. If you are under 30 you could get the flight paid for too! If you ever find yourself in Thailand and would like to learn how to meditate in a relaxed natural environment or even ordain as a monk for a month, then look no further. Pali blessing invoking the protection of the Triple Gem: sabba Buddha nubavena, sabba Dhamma nubavena, sabba Sangha nubavena, satta sothi, bavantu te. May your spiritual journey be fruitful and bring brightness into your life and into the lives of those around you. May you be well and happy, and may you be free from all suffering and misfortunes.